Brittain's Got Talent - A New Star! (CNN) -- The great-grandson of Apache warrior Geronimo argues in a lawsuit that a secretive society at Yale University holds the remains of his great-grandfather. Harlyn Geronimo has sued Yale and the society -- the Order of Skull and Bones -- to try to recover the remains. "I think what would be important is that the remains of Geronimo be with his ancestors," he said. Skull and Bones, a collegiate society that's been around since 1832, includes alumni such as former President George W. Bush and his grandfather, Prescott Bush. Author Alexandra Robbins said evidence backs up the younger Geronimo's claim that Skull and Bones has the Apache warrior's remains. "There's a Skull and Bones document that describes how Prescott Bush and other Bonesmen robbed the grave of Geronimo, and I spoke with several Bonesmen who told me that inside the tomb there's a glass display case containing [human remains] and the Bonesmen have always called it Geronimo," said Robbins, author of "Secrets of the Tomb," a book that delves into secretive societies at Yale, with special attention to Skull and Bones and its paths to power. CNN attempted to contact Skull and Bones, but no one returned calls. Yale said it does not have Geronimo's remains and that it does not speak for Skull and Bones. The controversy began in 2006, when a letter was found tucked into a book in the Yale library, according to an article published that year in Yale Alumni Magazine. According to the article, the letter -- written on June 7, 1918, by one member of the society, Winter Mead, to another, F. Trubee Davison -- said the secret society had Geronimo's bones, which had been dug up by other members of the group at Fort Sill, Oklahoma. Marc Wortman, a writer and former senior editor of the magazine, said he was the one who discovered the letter in Yale's Sterling Memorial Library. "I found it and said, 'This is amazing. This is quite stunning to see this.' It was laid out so clearly in straightforward language saying we've got Geronimo's skull, femurs and horse tack, and we've brought it back to the tomb, as they call [the Skull and Bones house] in New Haven [Connecticut]," Wortman told CNN. The robbing of Geronimo's remains fits into what Robbins calls "crooking" -- a competition among Bonesmen to steal valuable things, which were then hidden in the tomb, which has extremely limited access. Geronimo is one of the many Chiricahua Apache leaders who fought to preserve the culture and the lifestyle of their people in the late 1800s. He fought both the Mexican and U.S. governments in the area of southern Arizona and New Mexico. His descendant said it's important to honor Geronimo's legacy. "Geronimo's legacy today is that he is looked to as one of the strong leaders of the Chiricahua people who fought to preserve homelands, cultural identity, to preserve their way of life," said his great-grandson. Harlyn Geronimo is offended by the alleged actions of the Bonesmen. "After a while it hurts you inside because you know this is your (great) grandfather," he said. "It's just something that is uncivilized for people of this nature to do." 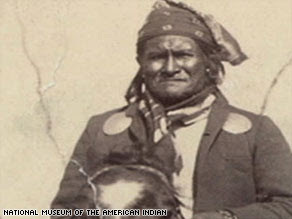 Geronimo died in 1909 of pneumonia while he was a prisoner at Fort Sill. The burial in the cemetery wasn't true to Apache tradition though, and his great-grandson wants to rebury his ancestor in accordance with Chiricahua ways. "They long for returning to their own homeland. They do not have their own reservation today. They are sharing a reservation with the Mescalero Apache," he said of the Chiricahua people. Not everyone believes the Bonesmen found Geronimo's bones. Some researchers have concluded that the Bonesmen could not have even found Geronimo's grave in 1918. In the Yale Alumni Magazine's article, David H. Miller, a history professor at Cameron University in Lawton, Oklahoma, cites historical accounts that the grave was unmarked and overgrown until a Fort Sill librarian persuaded local Apaches to identify the site for him in the 1920s. "My assumption is that they did dig up somebody at Fort Sill," said Miller. "It could have been an Indian, but it probably wasn't Geronimo." That isn't stopping Geronimo's great-grandson from pursuing what he believes are his ancestor's bones. President Barack Obama, Defense Secretary Robert Gates and Secretary of the Army Pete Geren are listed as defendants in the 32-page lawsuit Harlyn Geronimo filed in the District of Columbia. In 1990, a federal law was passed to protect Native Americans' rights to their family member's remains. The Native American Graves Protection and Repatriation Act addresses the rights of lineal descendants, Indian tribes and native Hawaiian organizations to Native American human remains as well as cultural objects. The lawsuit references the statute, asking the court "to free Geronimo, his remains, funerary objects and spirit from 100 years of imprisonment at Fort Sill, Oklahoma, the Yale University campus at New Haven, Connecticut, and wherever else they may be found." You may have seen this amazing photograph that is being circulated by email. I place it here now for all to enjoy. 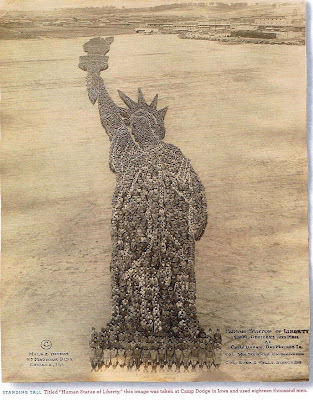 This photograph was taken in 1918 at Camp Dodge, Iowa. It is of an incredible 18,000 men preparing for war in this training camp. If you’re planning a cemetery outing, prior preparation will make the search easier. A call to a funeral home in the area you’ll be visiting can help you determine the cemetery layout, information that we lacked before our visit. We were fortunate to find someone who could help us on a weekend. Visiting during the week, if possible, would allow you to check with the local funeral homes in person. Take a camera to photograph the headstone. Headstone rubbings will actually cause chemical damage to the stone. Take photographs from several angles to help place the gravesite for future visits. Dress comfortably, and plan for changes in the weather. During our visit, a cold front was blowing its way through and the temperature was dropping throughout the day. It was also quite windy, adding a considerable wind chill factor that had us jumping back into our car frequently to warm up between section searches. In warm weather, be sure to have plenty of drinking water and wear a hat. Wear practical shoes for all the walking, and protective clothing as well. While most cemeteries are well kept, as was this one, I backed into a spindly tree trying to include the Parker County Courthouse with the gravestone in the same photograph. Ouch! Heritage Microfilm and the University of Virginia Library will team up to inspect, preserve, and digitize the University's international newspaper microfilm collection. Cedar Rapids, Iowa (PRWEB) February 18, 2009 -- The University of Virginia Library, the research library system of this major university founded by Thomas Jefferson, has partnered with Heritage Microfilm to preserve and digitize their expansive foreign newspaper microfilm holdings. The first library at the University of Virginia was Thomas Jefferson's famous Rotunda, which he placed at the heart of his design for the university, now a UNESCO World Heritage Site. Heritage Microfilm will first verify the condition of each roll and the degree, if any, of vinegar syndrome or redox. Heritage will then work with the University Library team to repair and catalog each reel. NewspaperARCHIVE, digital brand of Heritage Microfilm, will then scan each reel of microfilm and index for Optical Character Recognition. The final newspaper images will be available via NewspaperARCHIVE website and NewspaperARCHIVE's institutional product NewspaperARCHIVE's institutional website. "This project will make a valuable research collection even more widely available," said Barbie Selby, Research and Information Services Manager for the University of Virginia's Alderman Library. "These international newspapers will be used by historians, political scientists, sociologists and others to enrich their work and enhance their understanding of viewpoints from around the world." This partnership is a part of the Heritage Microfilm international initiative, aimed at making the world's newspaper history available online. "We're excited to be working with the University of Virginia Library," said Mike Willard, Director of Heritage Microfilm. "This is a unique collection of newspapers from around the world, and both students at the university as well as our members will benefit greatly from this valuable resource." Interested parties from non-U.S. countries or U.S. institutions with international content can contact the international team at International@heritagemicrofilm.com. Lowcountry Africana's new, central Internet home for free records of African American genealogy and history. Afriquest will officially launch at the end of February but volunteers may sign up now to participate. Copies of the microfilms of the original historic documents were donated by FamilySearch International. From today's Wizard of Id. New Orleans Slave Manifests, 1807 to 1860, has ship manifests (from National Archives microfilm) documenting more than 30,000 slaves en route to New Orleans from the upper Southern states. You can browse the record images, but you can't search them yet. World Archives Project volunteers are indexing them as you read this. See some transcribed information free on Afrigeneas. Confederate Applications for Presidential Pardons contains records of former Confederates who requested pardons. Lincoln successor Andrew Johnson issued a proclamation of general amnesty for Confederates, but it didn't cover certain groups such as government officials, higher ranking military officers and those with property valued at more than $20,000. Those people had to apply for pardons. Civil War Soldier Records and Profiles has information on nearly every officer and soldier who fought in the Civil War (compiled from sources such as state rosters and regimental histories). History definitely comes to life when we can find it described in the words of eyewitnesses. Often we find biased and boring accounts of the lives of the famous in history books. But once in a while we come across a source that gives us a better idea of how events shaped our nation and the personal lives of our ancestors. "As you are now Elected to the Presidency, & are probably out of a job at present, as no man will think of offering you a job for fear you would be above work now, and as I [have] a nice little job of about 500 cords of wood to chop and a lot of rails to make. So I thought I would write you, and See if we could not come to terms and exchange work, on fair terms if You will help me with my job. . ."
It appears that George was seeking to retain his position as postmaster, but I thought the job offer was an interesting tactic. “In 1814 Mr Neemo, an English born gentleman, but then an American citizen, neighbor of my Father on the Bayou Téche Louisiana had to join the army at New Orleans. Whilst there he received a letter from his Brother, informing him that he was in the British army only a few miles from the City. Mr. Neemo forthwith went to General Jackson, and told him of the circomstance [sic], showed him the letter, and said, "General, I am English born, but am now an American citizen, and I promise you that I will faithfully do my duty, can you not employ me in some way, that I may not come in contact with my Brother, & perhaps kill him. "Sir my object in relating this anecdote is to illustrate the fact, that…I have two sons; one of them Sylvan my oldest aged 28 years is in the Federal army a volunteer in the 1st Regiment of the Excelsior Brigade Co K. and the other James my youngest son unfortunately went to Louisiana a few months before this war commenced, and, before I could extricate him from those mad people he had enlisted in the rebel army, a boy less than 18 years old. President Lincoln promoted Mr. Carlin's son to Lieutenant. If you’re interested in learning more about how the area in which your ancestor lived was impacted during the Civil War, try searching for location names. Include searches for town or city, county, and also state. Obediah H. Platt wrote to President Lincoln to advise him of the plight of Unionists in Missouri. "one pair of Slippers worked by my Little Daughter as a presant [sic] for you from her.". . . I often think of you in those trublesome [sic] times and Pray God that he may give you Wisdom and Strength to guide the Ship of State into the harber [sic] of Safty [sic]. . . I am but a poor humble Mechanic and Seek no office But I Love my Country and would Die in its Defence [sic]." Valentine's Day is the second most popular holiday to send a card. The Greeting Card Association claims that an estimated one billion cards are sent each year. Yet, most of the people who send the cards have no idea who Saint Valentine was. Even historians cannot agree. According to some authorities, there were two Valentines. One was a priest and doctor who was martyred in the year 269, and the other was the bishop of Terni, who was brought to Rome to be tortured and executed in 273. Others say it was the same person. Both men (or the same man) have legends attributed to them concerning love and matrimony, legends that may or may not be true. According to one rendition, Roman Emperor Claudius II issued an edict saying that his soldiers were not allowed to be married. Apparently, Claudius thought that married soldiers weren't as good as single soldiers. As you might imagine, this news was not well received among the military men. Valentine obviously disagreed with the edict and continued to marry young couples, even though Claudius forbade it. When Claudius found out, he ordered Valentine to be beheaded, and the sentence was soon carried out. Whether the stories involve one man or two, Pope Gelasius declared February 14 as St. Valentine's Day around 498 A.D. Recognition of the holiday clearly had taken hold by the Middle Ages. At that time, it was believed that birds begin mating in the middle of February. Even Chaucer wrote in the fourteenth century, "For this was sent on Seynt Valentyne's day, whan every foul cometh ther to choose his mate." Nonetheless, this martyred saint probably is responsible for the fact that many of us are alive and walking the earth today. Without the excuse of Saint Valentine's Day, how many of our ancestors would never have courted and consequently never have married? How many of us would not have been born? Perhaps we all owe a debt of gratitude to Saint Valentine for our very existence. PROVO, UTAH – Feb. 12, 2009 – Ancestry.com, the world’s largest online resource for family history, announced today it will commemorate the 200th birthday of one of the nation’s greatest Presidents – Abraham Lincoln – with the addition of five new databases to its Civil War Collection. This historically significant collection includes unique content such as photographs, handwritten letters, slave manifests and pension applications, and spans the days of slavery to the Civil War and through Reconstruction. The new databases will make millions of important Civil War era records easily searchable alongside other records already available at Ancestry.com, creating the largest online collection of Civil War documents, containing more than 12 million names. Among the five new databases, The Abraham Lincoln Papers is an incredible collection of more than 20,000 documents – most from the 1850s through Lincoln’s presidential years – which include drafts of speeches and the Emancipation Proclamation, incoming and outgoing correspondence and notes, and printed material. 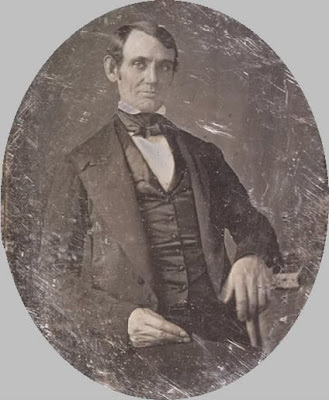 The Abraham Lincoln Papers Collection will be searchable for free on Ancestry.com. Abraham Lincoln Papers (from the Library of Congress) – a collection of more than 20,000 letters written to and from President Lincoln, as well as drafts of speeches. The collection includes a letter from Mary Lincoln, Lincoln’s wife, who chides him for not responding promptly to her letters and requests a check for $100. Other documents include a draft of Lincoln’s speech from 1863 condemning slavery and a letter from May 11, 1863 written by Ellie B. Reno, niece of Brig. Gen. Jesse Reno – who had disguised herself as a male to fight in the Union Army – asking him, “…iff [sic] I can remain in your Service…” These letters can be searched for free on Ancestry.com. New Orleans Slave Manifests, 1807-1860 – includes images of ship manifests transporting more than 30,000 slaves en route to New Orleans from the upper Southern states. It offers insights into the lives of these men and women, who were likely being moved to the lower Southern states to provide labor for the booming cotton industry. The manifests will be transcribed by a global community of family history enthusiasts through Ancestry.com’s World Archives Project in the coming months. Confederate Pension Applications from Georgia – more than 60,000 records documenting pension applications filed in Georgia from Confederate soldiers and their widows. As part of the application process, applicants answered a series of questions about themselves and signed the document, resulting in a wealth of personal information. Confederate Applications for Presidential Pardons – a collection containing more than 15,000 records of former Confederate soldiers and government officials requesting Presidential pardons. U.S. Civil War Soldier Records and Profiles – contains more than 4.2 million records and profiles about nearly every officer and soldier who fought in the Civil War. Many of the records include actual photographs of the individuals. Over the next two years, Ancestry.com will add millions more historical records from the Civil War period to its Web site, as the country approaches the sesquicentennial (150th) anniversary of that historic conflict. The five new Civil War databases are now available online as part of Ancestry.com’s Civil War Collection at http://www.ancestry.com/civilwar. About Ancestry and The Generations NetworkThe Generations Network, Inc., through its flagship Ancestry.com property, is the world's leading resource for online family history. Ancestry.com has local websites in nine countries and has digitized and put online over 7 billion names and 27,000 historical records collections over the past ten years. Since July 2006, Ancestry.com users have created 9 million family trees containing 865 million profiles and 16 million photographs and stories. The Generations Network also includes myfamily.com, Genealogy.com, Rootsweb.ancestry.com, MyCanvas.com, dna.ancestry.com, Family Tree Maker and Ancestry Magazine. More than 7.9 million unique visitors spent over 4 million hours on a TGN website in December 2008 (comScore Media Metrix, Worldwide). The grassy earth held strong for almost 300 years, withstanding the footsteps of the millions of tourists who have traipsed through the Granary Burying Ground and wandered off the footpaths for a closer look at the weathered headstones of historic figures. It held strong, that is, until the last day of January, when a woman on a self-guided tour of the hallowed cemetery in downtown Boston took a fateful step. The ground gave way, and the woman fell hip-deep into a hidden granite stairwell leading down into an unmarked brick crypt. The woman, who was not injured, accidentally discovered a long-forgotten entrance to a tomb in the city's most famous graveyard, less than 10 yards from the stone marking the resting place of Paul Revere. It served as a reminder that in Boston, the nation's revolutionary roots are literally underfoot. "Somebody put weight in just the right place, like the straw that broke the camel's back," said Kelly Thomas, who leads the city's Historic Burying Grounds Initiative. The woman's foot did not crash into a coffin or even come close to coming in contact with any bones in the hole, which opened up to be about 3 feet deep and 18 inches across. She fell into a stairway that leads into the tomb like a basement bulkhead. The 8-by-12-foot brick crypt remains intact and structurally sound, Thomas said. The stairs leading to it had been covered by a slate slab that appears to have broken some time ago, allowing dirt to pile on the upper steps. The soil slowly weakened, Thomas said, and finally gave way under the woman's weight. "Things fail. Mountains become dust," Thomas said. "That slate slab deteriorated." The burying ground has increasingly become a must-see for visitors to Boston because of the number of historic figures interred there, including Declaration of Independence signers Samuel Adams and John Hancock, as well as the five victims of the Boston Massacre, said Sam Jones of The Freedom Trail Foundation. "The graveyard is not designed to put up with the abuse it gets from the visitation it receives," said Jones, adding that private donations are needed for cemetery upkeep as the city wrestles with a budget shortfall. The cemetery is home to an estimated 5,000 remains in a jumble of graves, tombs, and monuments, making it hard to determine who is buried in the crypt the woman breached. Records at the Massachusetts Historical Society indicate that it could possibly be the grave of Jono. Armitage, who appears to have died in 1738. Jonathan Armitage was a Boston selectman in 1732 and 1733, city records show, and Captain Jonathan Armitage served on The Committee of Fortification in 1733. The identity of the tourist who put her foot into history, however, will remain a mystery. The city refused to release her name, citing privacy concerns. The hole has been temporarily covered with a sheet of plywood and a slab of modern white concrete and set off by four bright orange traffic cones at each corner. Structural engineers will examine the crypt, and it will probably be resealed with a slab of reinforced concrete and reburied. There is no timeline for repairs, and the Tremont Street cemetery remains open, although heavy ice on the walkways kept the gates locked yesterday. That left Erik Ewers disappointed as he stood looking in through the black metal fence. "You look at these tombstones, and each tombstone represents an individual life, existence, a career, a family history," said Ewers, a film editor for documentarian Ken Burns who tried to visit the site yesterday. "For me, graveyards are like a thousand untold stories." Craters and other hazards from crumbling tombs are not uncommon in the city's 16 old burying grounds, which date to the 1630s and have long been punished by shifting soil, traffic vibrations, freezes, and thaws. The techniques used to fix the problems can be as old as the cemeteries. Heavy machinery cannot be lugged onto the fragile earth, so excavating must be done with shovels. That means frozen ground can delay repairs. Contractors who specialize in historic masonry do their best to shore up the structures from the outside so they do not disturb the graves. "You end up really caring for the people," Thomas said. "It's really strange. You don't know them, they've been dead for hundreds of years, but still." David Butler of the Globe staff contributed to this report. Nicholas Grod of Portland, Oregon used an online obituary to track down the rightful heir to a fortune in US Government bonds that he found hidden in his basement. KATU-TV (Portland, OR) reports that last year Grod was cleaning out the basement of his Portland, Oregon home and found a homemade box wedged under a shelf. In it he found $200,000 in US Bonds, family photographs, a letter and clues to the person who had left them there. Nicholas Grod used the Internet to track down the details about the previous owners of the house. He had reached a dead-end in the census - but "but an online obituary led Grod to a grandson named Thomas Fagg who lived in Tulsa, Oklahoma." From that online obituary Nicholas Grod made contact with Thomas Fagg, now 2,000 miles away, and sent him the box and valuables that he had found hidden in his basement. Wow - Thomas Fagg was thrilled to receive those family photos - he didn't have any pictures of his grandfather - he was also pleased to receive the bonds. “There are no words in the English language that can express the gratitude and admiration I have for this man for being so, so honest,” Fagg said. I get to do a lot of fun sleuthing, such as the time I got to look into the roots of Robin Roberts of Good Morning America. She wasn't that excited about the prospect until she walked in the footsteps of one of her ancestors, a woman who had lived in West Virginia back in the mid-to-late 1800s. It also surprised her to see her Roberts line traced back to the 1790s. If you've got a few minutes, check out this video. The Roadside Resort web site has an interesting article about cemeteries that are in the middle of parking lots. In most cases, new parking lots were built around existing cemeteries. The article includes pictures and even links to Google Maps and Windows Live that will provide maps and even satellite images of each location. You can read the article at http://www.roadsideresort.com/blog/paved-paradise-cemeteries-in-parking-lots. My thanks to Marie DiVita for telling me about this unusual article. (CNN) -- Deep-sea explorers say they have solved "one of the greatest mysteries in naval history" with the discovery of what was "the world's mightiest and most technically advanced warship" when it sank in 1744. The HMS Victory -- the predecessor to a historic British flagship of the same name -- was found "far from where history says it was lost," Odyssey Marine Exploration said in a news release Monday. The find in the English Channel exonerates Adm. Sir John Balchin, one of "the greatest admirals in English history," because it shows that the ship went down in a violent storm, not due to any mistakes he made, Odyssey said. It did not specify the ship's exact location. Maritime lore said the ship went down in the northern part of the Channel Islands, south of England near the coast of France. Stories about treasures -- including gold -- that may have been on the ship have existed ever since its disappearance. This HMS Victory was a predecessor to the historic British ship that took the same name and which served as Admiral Nelson's flagship in the Battle of Trafalgar in 1805. In court papers seeking exclusive salvage rights, Odyssey says the wreck site "consists of cannons and other unidentified objects. Odyssey believes that potentially valuable cargo may be located at or near the site." The papers were filed in U.S. District Court in Tampa, Florida, where Odyssey is based, seeking exclusive salvage rights. There were nearly 1,000 people aboard -- "900 sailors, plus a complement of marines and 50 volunteers drawn from the noblest families of England," Odyssey said in information about the ship released together with the Discovery Channel, which chronicled the find. Based on reports from the time, there may be as much as four tons of gold on the ship, Odyssey and the Discovery Channel said. "Additional research indicates that there were large quantities of both silver and gold coins aboard. ... Research suggests that this prize money will also likely be located at the wreck site. "... However, no coins have been located at the site to date, and no accurate assessment as to their value can be made prior to location, recovery and analysis." The potential treasure also comes in another form -- bronze weaponry. "The site's anticipated ordnance collection" includes "the single largest collection of bronze cannon in the world" and "the largest consignment of bronze guns ever manufactured and preserved today," Odyssey said. Two cannons have been recovered -- "a 12-pounder featuring the royal arms of George II" and a "42-pounder bearing the crest of George I," it said. "The huge 42-pounder recovered is the only known example of a gun of this type and size currently in existence on dry land. The only other artifacts recovered to date were two small brick fragments that were brought into U.S. federal court in order to file an admiralty arrest of the site." Admiralty arrest is a step mandated under international maritime law. The discovery could set up a legal battle with the British government. If it really is the HMS Victory, "her remains are sovereign immune," the British Ministry of Defense (MOD) said in a statement on its blog Monday. "The wreck remains the property of the Crown. We have not waived our rights to it. This means that no intrusive action may be taken without the express consent of the United Kingdom." In its statement, Odyssey said it "has been cooperating closely" with the ministry, and "all activities at the site have been conducted in accordance with protocols agreed with MOD and Royal Navy officials." The ship has deteriorated to the point that recovering it is impossible, Odyssey said. "A plan is being developed for an archaeological excavation of the site, and artifacts will be recovered in accordance with a scientific project plan, which will be submitted to the UK MOD for review and approval." The company has proposed that it be paid "with either ... a percentage of the value of the collection that has been recovered, conserved and presented to the UK government, or a percentage of the coins or other artifacts that the government decides to (sell)." The ship was found nearly 100 km (62 miles) "from where the ship was historically believed to have been wrecked on a reef near the Channel Islands," Odyssey's statement said. "Having discovered it in deep water far from where history says it was lost has served to exonerate Admiral Balchin and his officers from the accusation of having let the ship run aground on the Casquets due to faulty navigation," said Greg Stemm, Odyssey's chief executive officer, in the statement. Odyssey said the "prevailing belief" about the ship's fate was that it had "smashed into the Casquets, a group of rocky islets" north of Guernsey, the second largest of the Channel Islands. But the evidence, Odyssey's statement said, suggests "the ship sank as the result of a violent storm and suggests that the design and construction of the ship contributed to her loss." Odyssey released press materials about the ship in cooperation with the Discovery Channel, which chronicled the find and will be showing it in a program this week called Treasure Quest. "The English Channel is a treacherous place to navigate," Discovery Channel President John Ford told CNN Radio. "The ship was returning from Portugal and got caught up in a storm. And despite being judged unsinkable at the time, sort of like the Titanic was, this very, very large ship went down in a storm and vanished without a trace." This month we celebrate President Abraham Lincoln's 200th birthday. You may already know that Lincoln was born in a log cabin in Hardin County, Kentucky, on February 12, 1809. However, you may not have known that he was the first president born outside the original thirteen colonies. He was also the tallest president and the only president to be issued a patent; he invented a levy device that lifted boats over shoals in the Mississippi River. This is totally off the genealogy beat - but you've got to watch this act!